Renaissance humanism began in Italy during the Renaissance Era. 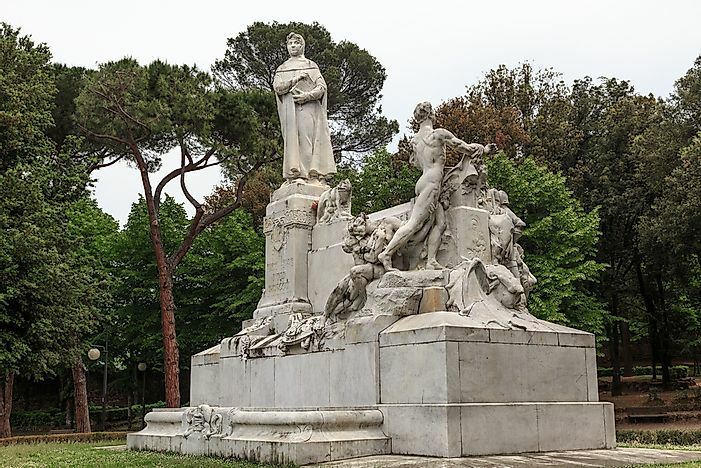 Monument to Petrarch, considered the father of Renaissance humanism. Renaissance humanism, also referred to as classical humanism, is the study of various antiquities which began in Italy during the Renaissance era and spread across Europe from the 14th to 16th centuries. Renaissance humanism was used to differentiate the development of humanism during the Renaissance era from the earlier ones. Classical humanism was developed to respond to the utilitarian approach associated with the medieval scholars. Humanism was a unique program meant to revive moral philosophy, literary legacy, and cultural legacy of the classical antiquity. What Is the Origin of Renaissance Humanism? Some of the first humanists, including Poggio Bracciolini, Giovanni Boccaccio, and Petrarch, were collectors on the ancient manuscripts. Petrarch is recognized for his devotion to the Roman and Greek scrolls and thus referred to as the father of humanism. By the mid-15th century, the humanist educational program was accepted in Italy and many upper classes people had learned humanism education and Scholasticist education.The migration of émigrés and Greek scholars from Byzantine after Byzantine dynasty ended around 1453 helped in reviving the Roman and Greek science and literature through their familiarity with all the ancient works and languages. The adoption of large-scale printing during the end of the incunabula period helped spread Italian humanism to other countries in Europe including England, France, Low Countries and Germany. Bude Guillaume, a pre-eminent French humanist, applied the philological approach of the Renaissance humanism to his studies of legal history and ancient coinage which resulted in him composing a thorough explanation of Justinian’s code. Unlike the earlier republican Italian umanisti, Guillaume was a royal-absolutist who lived an active civic life while he was Francois I’s diplomat plus he helped develop the College de France. Who Was the First Great Humanist? Francesco Petrarca, who was born in 1304, is known as the first great humanist in history; in fact, he is the father of humanism. Although Petrarch grew up in Italy, he traveled widely and collected numerous ancient texts. Petrarca was pulled between two worlds, his desire to improve the world and the world of antiques. Petrarch believed that he could learn how to develop the world by studying the classical literature. Petrarch and other humanist admired the beauty of ancient texts, and he tried to share the teaching of these discoveries by examining them and then imitating them in his Latin writings. How Did Renaissance Humanism Affect Christianity? Most of the humanists who lived during the renaissance era like Pope Leo X, Sixtus IV, and Pius II were churchmen plus the senior church figures supported humanism. During this period, most of the humanist’s efforts helped improve the translation and understanding of early and biblical Christian writings. The rediscovery of the classical science and philosophy by Poggio Bracciolini in 1417 challenged various traditional religious beliefs which resulted in many numerous humanists questioning the Catholic theology. The discovery of the manuscripts of Lucretius, De Rerum Natura, which had been lost for centuries resulted in many people challenging various Christian beliefs and the formation of protestant-reformation. Under Martin Luther, the Reformation challenged many Catholic theologies, and this pushed the council of Trent to form a counter-reformation. The counter-reformation imposed a strict Catholic orthodoxy on other changes which are followed to date. What And When Was The UK Urban Renaissance? Who Is Often Regarded As The Father Of Renaissance?